Because of recent legislative changes to the Road Traffic Act in Wales, the directors of the planned Welsh Road Race at the historic Eppynt circuit in August have been forced to announce that the event has had to be postponed until next year. 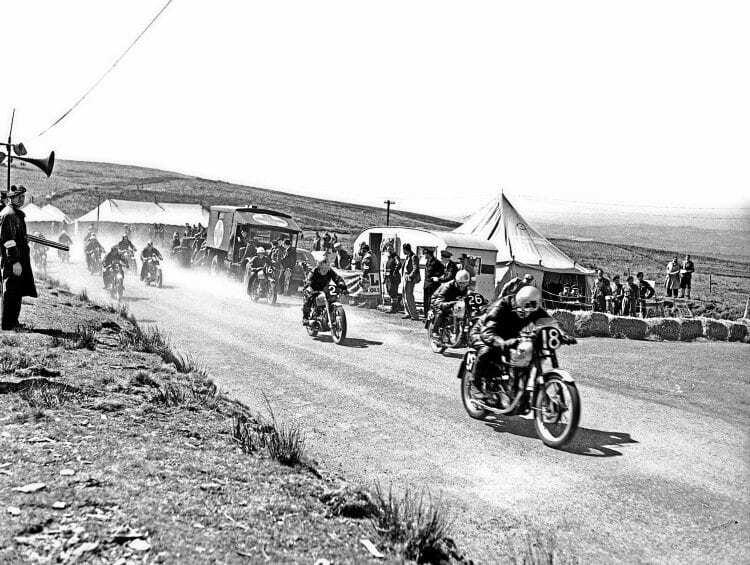 Eppynt Road Race 1953. Start of first race of the day. Note number two, CA Richards on a Douglas. A date for the 2019 event has already been requested, and will be announced shortly. On January 9, a hearing took place regarding the repeal of the RTA to allow the use of closed public roads for motorsports events, and this came into effect on February 2. The changes mean, though, that there will not now be enough time to obtain to correct permissions for this year’s planned event. “We are working closely with the Auto-Cycle Union, Crown Properties and Powys County Council to organise the Welsh Road Race, and under the new changes in legislation the deadlines that have been imposed would have made it very difficult to carry out a safe and successful event,” said the managing director of the Welsh Road Race, Derek Smith. Previous Post:Who can identify this motorcycle?